Yoke type track roller bearings are either needle or cylindrical roller bearings with a particularly thick-walled outer ring and are used in applications such as cam gears, bed ways, conveying equipment and linear guidance systems. In addition to high radial loads, they can also support axial loads due, for example, to slight misalignment defects or skewed running. 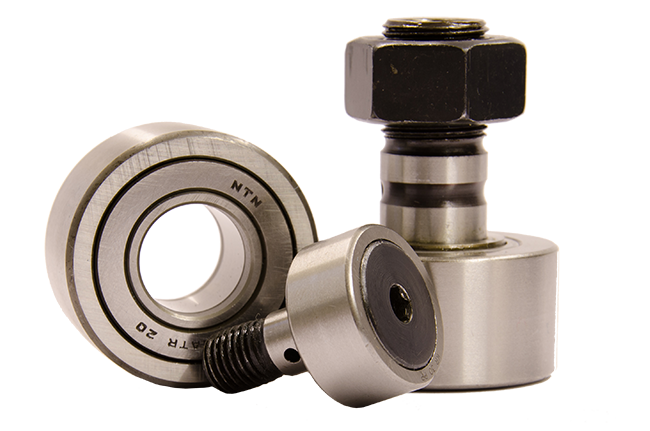 Yoke type track roller bearings are mounted on a shaft or stud and supplied with or without an inner ring. Stud type track roller bearings correspond in their design to yoke type track rollers with axial guidance but, in place of the inner ring, they have a heavy-section roller stud. The stud has a fixing three and, in most cases, a hexagonal socket on both ends. Ball bearing track roller bearings correspond in their design to deep groove or angular contact ball bearings but have thick-walled outer rings. They can support high radial loads as well as axial loads in both directions. They are available with and without a stud which has a fixing thread.